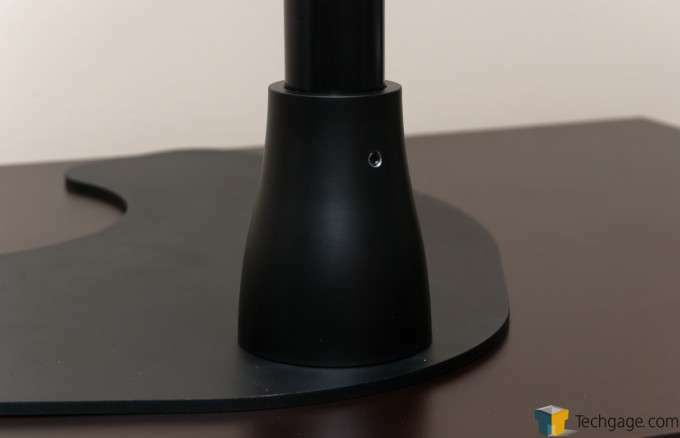 A monitor stand might sound like a simple product, but if you happen to pick one up that’s built poorly, you’re going to quickly regret it. This is especially true with stands that support multiple monitors – some are simply built better, and designed better. With Ergotech’s Freedom Quad Desk in the lab, let’s see what it’s made of. After embarking on a Web search to find the “perfect” product of a certain type, you’re bound to stumble on the same names over and over again – hopefully for positive reasons. 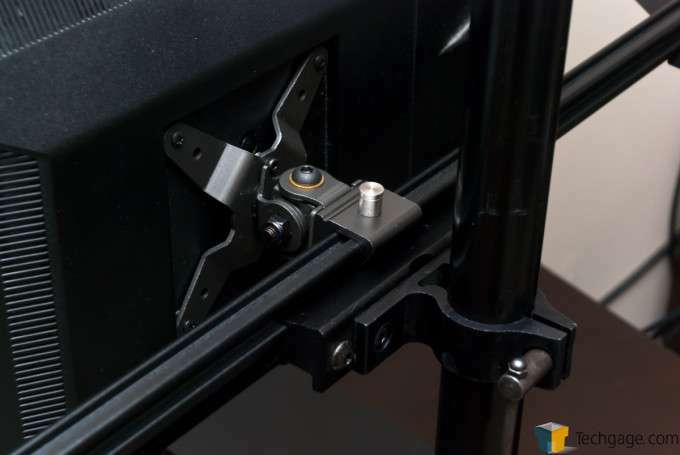 Where monitor stands and mounts are concerned, it’ll be Ergotech’s name to pop-up often, and yes, it’s for positive reasons. 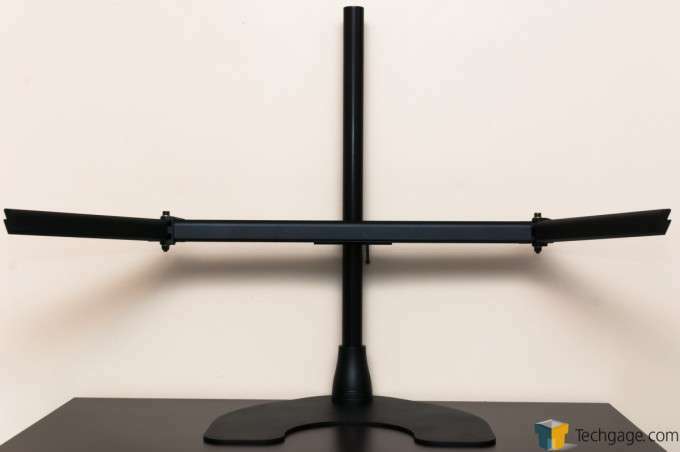 Over the course of its existence, Ergotech’s earned a reputation for building some of the best monitor stands and mounts out there – especially true where gaming’s concerned. It’s for that reason that I sought Ergotech out when I needed to replace the stand on our graphics card benchmarking PC. Well, that and the fact that our very own Brandon Mietzner owns the exact same model I’m looking at here – he swears by it. 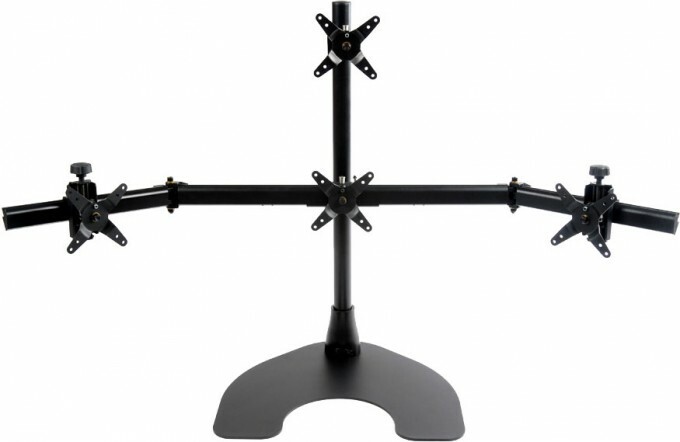 Ergotech offers a number of stands suitable for gaming, all of which include swivel bars to allow the end monitors to remain flat like the center one, or turn in on an angle. The 100-D16-B03 “Freedom Triple Desk” is the most popular Ergotech stand for gamers; it’s a 3×1 solution that supports up to 24-inch displays. 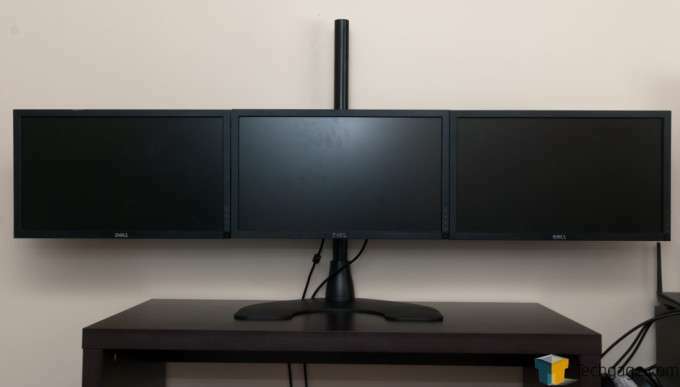 The 100-D28-B13 “Freedom Quad Desk” – the focus of this review – is similar in design, but adds support for a fourth top-mounted monitor. A “3+1” configuration might seem a bit odd at first – and I admit, it was a little odd to me – but it allows someone to get their game on while being able to keep track of something else at the same time, simply by looking up. Want to school some noobs in Battlefield 4 but also want to keep a close eye on Thursday Night Football? You could do that quite easily with such a configuration. 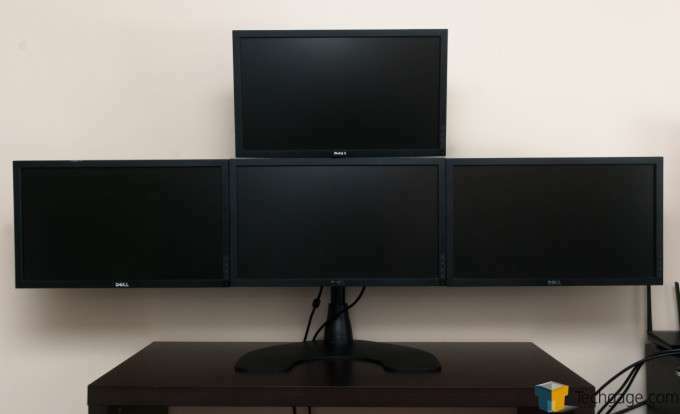 Don’t need that fourth monitor? The 100-D16-B03 would be the more logical choice. While both of the aforementioned stands are suitable for gaming, neither are classified as “gaming stands”. Two are, however, and both fall under the WSGF Edition brand. The Triple XL model is similar to the Freedom Triple Desk, but it supports displays up to 27-inch in size. The Ultimate can fill the 3+1 role like the Freedom Quad Desk, but with 27-inch displays, or support 5×1 portrait with 24-inch displays. All four stands have a number of neat features, including the use of quick-release pivots (allows genuinely easy removal of a display from the stand), a flat base (which allows a keyboard or other things to sit atop it), a maximum weight of 25lbs per display, and perhaps most intriguing to anyone in the market for a stand: A lifetime warranty. I’ll cover some of those features in more detail as the article progresses, and on that note, enough of this dribble – let’s get on with a closer look at the Freedom Quad Desk. I almost never include a photo of product packaging in my reviews – it’s for a reason – but I felt the need to include an unboxing shot here just to give you an idea of what you’ll be dealing with as soon as you take everything out of the shipping box. Four of the small boxes contain a pivot (2x standard for the center, and 2x adjustable for the sides), while the other one includes a couple of cable-routers that clip onto the pole. 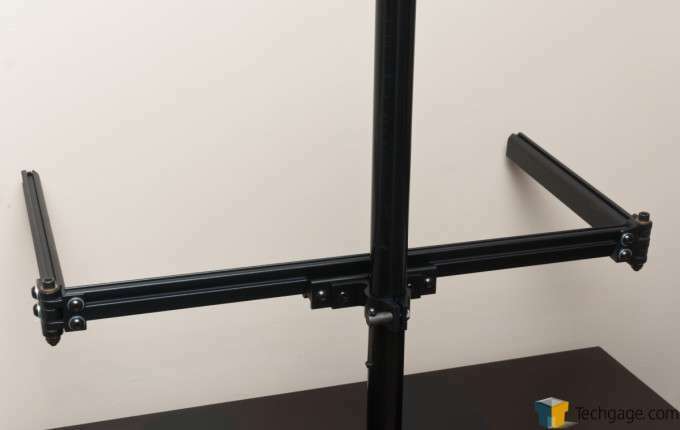 The 20lb flat base can be seen leaning against the wall, while the pole and the arm assembly sits in front. After dealing with a multi-monitor mount that turned out to be a total pain to deal with – heck, I managed to break a piece of it during the installation – I was very weary going into this build. Fortunately, my fears were quelled when I opened all of the boxes and saw how few pieces there were to deal with. In the end, and as you’ll see, the Freedom Quad Desk features an intuitive design, and makes for a setup so simple, instructions might not be needed. First step: Insert the pole into the hole, something I managed to do well on the first try – for once. Once in place, a hex key (included) needs to be used to completely secure it. Before going further, I need to emphasize the fact that this stand is built like a tank. I am certain I could write a car off with a couple of swings of the pole, and the base will instill confidence that your displays are not going anywhere. Furthering that feeling is the seriously well-built arm assembly, which is fully installed in the shot below. Next-up, a shot of the build up to this point, with the arms positioned in such a way that the end displays would be angled inward. Once again, I must mention that every single aspect of this stand feels sturdy. Even the joints, which allow easy swaying of the arms, are heavy-duty. As I mentioned earlier, the center displays utilize simpler pivots than the side ones, as it’s up to you to set the proper height when adjusting it on its pole. You are still able to adjust its angle up and down, however. Ergotech has patented the design of its pivots used here due to their “quick-release” design. 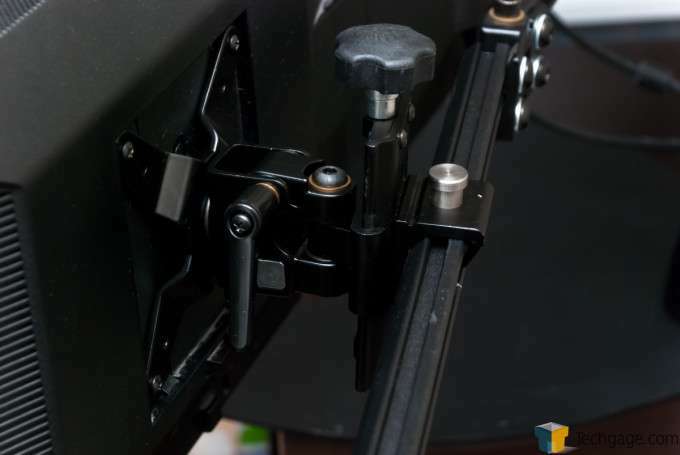 The arm is in effect a rail, and rather than sliding a monitor on one end and into the position it needs to be, you angle the display so that it grabs hold of the rail, and once you bring it forward, it will secure itself. The silver bullet seen on top is what secures it in place; likewise, it’s also what allows you to remove the display in just a couple of seconds (you lift up on the top, and then angle the display upward and lift up). 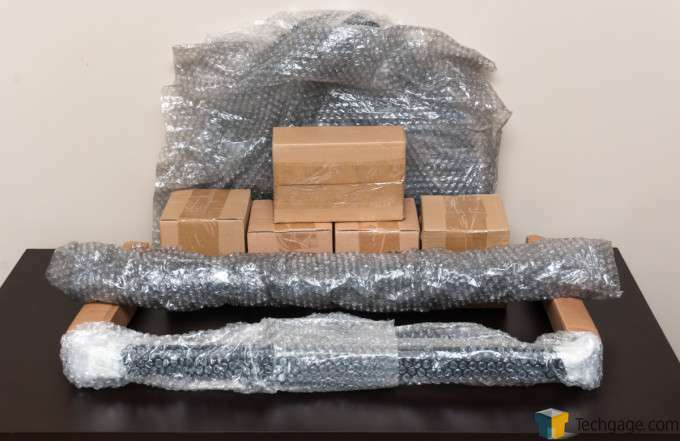 Once a display is in place, it’s free to be moved left and right as you need it, something that might require a couple of deep breaths since A) a display can be heavy, and B) it will need to be lifted slightly to reduce its grasp on the rail. The adjustable pivots are a little more advanced, but are pretty easy to understand. The knob at the top can be turned to decrease or increase a display’s height, and the little handle can be turned to allow it to be brought forward – you’re effectively able to manipulate the display in any way possible to get it properly aligned with the center display. Because this particular PC is used only for benchmarking and light gaming, I prefer to keep the side displays totally flat. This is because I feel games look more natural that way. That said, for non-gaming, I think turning the end displays inward would make more sense, since your eyes wouldn’t need to focus as hard to see everything on each display. Either way – these mounts have “Freedom” in their name for a reason; your configuration can be different from mine. That display was installed a little bit differently than the others, but it was probably the easiest one to set up. 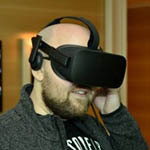 That display’s pivot connects to a small mount that slides down the pole which still uses the rail system, but is only about 2 inches wide. Overall, once in place, it still felt very secure, and was easy to manipulate. And… that’s that. Let’s get into some conclusions, shall we?